Treat yourself to the intoxicating blend of light and heady notes found in Marina de Bourbon. Floral notes will brush your senses with the scent of fresh flowers, while citrus notes add a refreshing touch and a base note of vanilla heightens the sweetness of this women's perfume, introduced by Marina de Bourbon in 1994. The casual fragrance will stick with you throughout the day, making it an excellent choice for daytime use, lunch dates, office wear, and even after the gym. I love this fragrance. I smells like soft spring flowers and is not over powering. This is a fragrance that is not offensive o others. I read about this fragrance and wanted to give it a try (working on the proper pronunciation). It is lovely! I am not a perfume kind of woman, as I prefer to only wear ''pure" essential oils on my skin. I found that this fragrance is the perfect compliment and adds lasting scent by spraying a little on my clothing...very feminine and not overpowering. It definitely has my vote!!! 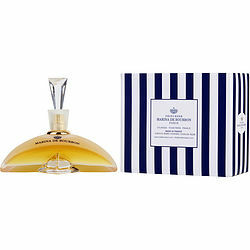 Marina De Bourbon by Marina de Bourbon was a great start for the exploration of fruity fragrance. I love citrus, and this provides it, as well as that fruit note. And the bottle! Wonderful fragrance. You can wear it anytime. Unusual.